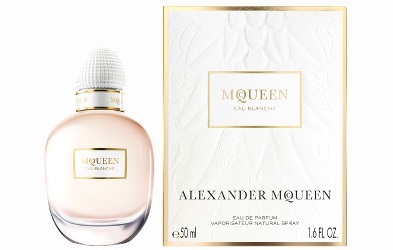 Alexander McQueen has launched McQueen Eau Blanche, a new fragrance for women. McQueen Eau Blanche is a flanker to 2016's McQueen and follows McQueen Eau de Parfum. Introducing McQueen Eau Blanche: a true expression of modern femininity. With top notes of Violet Leaves resting on base notes of Sleek Wood and White Musk, a newness and modernity is introduced to McQueen Eau Blanche to unveil the brighter, more luminous aspects of the three night blooming white flowers, Sambac Jasmine, Tuberose and Ylang-Ylang, at the heart of the signature scent. McQueen Eau Blanche recalls the unique shape of McQueen Eau de Parfum: a heavy yet delicate flacon, it represents the scent’s beautiful lightness and deceptive depth. A work of artistic craftsmanship. McQueen Eau Blanche is available in 50 and 75 ml Eau de Parfum. Violet leaf seems to be having a bit of a moment, or is it projection on my part? I hope I get to try this. It goes so nicely with white musk? j/k. I like the EdP but doubt I’ll like a more “luminous” version. I actually tried the Eau Blanche side-by-side with the EDP, and would not describe it as luminous. It is a more powdery version of the other two, and not any lighter. Ah, good to know, thanks! I am actually having a difficult time deciding which one I prefer more. The Eau Blanche is more within my comfort zone, due to the powdery musks. While, the EDP is much more floral than any the perfumes I already own. Though, I was given a sample of the EDP. It is too bad they aren’t doing travel sizes — you could get one of each. Actually surprised they aren’t, now that nearly every brand is doing rollerballs & whatnot. To me, the bottle is reminiscent of SJP’s Lovely.